Ok, so I know we are technically still in Summer and as I write this the weather this week is set to peak at 30 degrees again (give me strength! ), but I am pretty positive that once this week is out of the way we will start to see the real beginnings of Autumn. I've been reflecting on some of the things I love about Autumn and I thought I would share them all with you in a bid to get us all a little bit excited for the months ahead. There's just something about how picturesque and Instagramable everything looks during Autumn and when all the leaves are dropping off the trees. It's a photographers dream! I love all of the fiery colours of the leaves mixed together which begin to line the previously glum looking pavements. I also love the crunching sound of the leaves under your feet as you walk about which always reminds me of my childhood and returning to school after the Summer holidays. I find dressing for Summer a real chore so i'm really looking forward to being able to start layering my clothes again. I think my favourite item of clothing has to be the cardigan as I like to be able to cover up both my arms and my bum! I have also really missed wearing jackets and coats as their pockets are always so useful for storing various items such as my phone and dog poop bags. 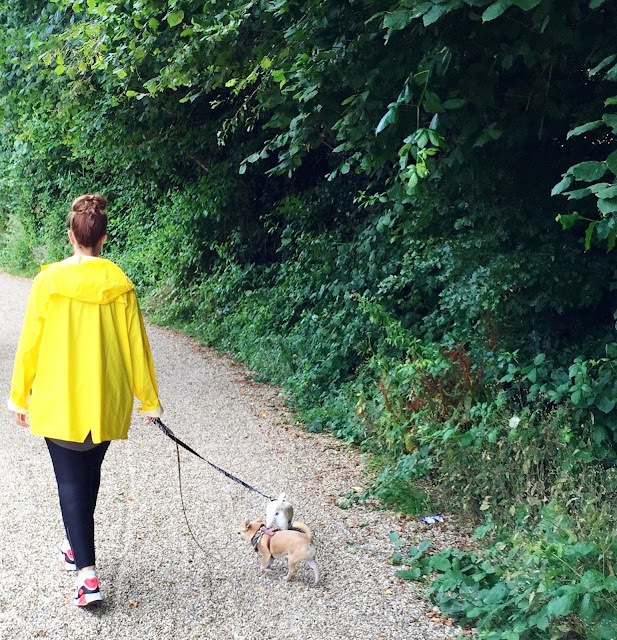 I'm especially excited to start wearing my new yellow rain mac. I don't know about you but I love having the option of wearing a hat, primarily due to bad hair days. I just love the fact that you can so easily cover up your hair and still feel cute in a hat. If you have a bad hair day in the Summer there really is no getting away from it and it can potentially ruin your whole day. I am pretty big on all accessories anyway so my wooly hat collection is quite epic and I genuinely look forward to being able to wear them again. I have always loved Halloween and to be honest I have no idea why because I'm not massively into horror films or being scared in any way. Despite that I always embrace Halloween as it's a great excuse to add some decorations to our home and dress the pets up for silly photographs! It's also the one time of the year when I will allow my husband to put a scary movie on. We always make a night of it by walking around the neighbourhood to look at everyone else's decorations and all the children trick or treating. We then get some snacks in and enjoy a spooky night in together. Continuing along the Halloween theme, Autumn is a great time of year to go pumpkin picking. Every year until now I have always picked a pumpkin up from a shop but after our fruit picking escapades this Summer I am excited to actually go and pick our own pumpkins fresh from the farmers field this October. Ever since my husband and I moved in together it has been our tradition to carve pumpkins together for Halloween and it always gets pretty competitive! One of the main things I look forward to with the arrival of Autumn and Winter are cosy nights in. I love putting on my favourite cosy indoor clothes and snuggling down under a nice fleecy blanket with my husband and the pets. And a cosy night in just isn't the same unless its cold outside! It's also much more enjoyable when you don't feel guilty about not being outside enjoying the light and warm evenings. Last year we had a log burning stove installed into our fireplace and the thought of having that alight again just fills me with happiness! With the arrival of colder weather comes back my thirst for hot drinks again. I know people say that hot drinks cool you down in hot weather but I can never face a hot drink during the Summer months. The only downfall for me during this time of year is that I don't like coffee and I really wish I did because all the flavours and varieties look incredible! I am however going to give it a go one more time and order myself one of the infamous pumpkin spiced lattes. It just has to be done right!? Although i'm pretty much certain i'm gonna hate it. I've said it before, and I know I am in the minority, but I love the cold weather! I think I have the opposite to SAD (seasonal affective disorder) but I genuinely always feel my best during the colder months. My energy levels go up as well as my levels of motivation - weird I know but it's just what happens! I find myself exercising more, squeezing more into a day and feeling more creatively inspired. If you gave me the choice between being too hot or too cold I would always choose cold. After all the excitement of Halloween is over next comes up my other favourite evening of the year, fireworks night. There's something about the smell in the air around fireworks night which is just so familiar and comforting. I never miss a fireworks night display, even when I have been feeling unwell I have still forced myself out to see a display. Bonfire night was always a big event in my family growing up and that tradition has just stuck with me. The only downside for me is having pets and how people choose to let off fireworks over a two week period instead of just sticking to one night. You would think Summer would be perfect for enjoying a long walk but for us, with lots of small dogs who can easily overheat, we tend to enjoy the nicest and longest walks when the weather is colder. During Autumn we pretty much make an event of going for a walk on a Sunday. We load the dogs up in the car and drive somewhere out of town and walk for miles. My favourite part of this is getting all chilly, feeling like i've been exposed to the elements and then coming back to a lovely, cosy and warm home and enjoying a nice vegan roast dinner. I think it's the first time that I'm actually looking forward to Autumn - I'm just getting so sick of our terrible excuse for a summer that I just want to get it over and done with! The thing I'm looking forward to most is Halloween. It's my favourite holiday season after Christmas! I can't wait! I love Autumn because of these things too! I love the falling leaves which makes it a little more extra for a photo op, how I can layer clothes and clothes and clothes, cold weather ~ and on sale candies because of Halloween! :)) also, it means we're almost close to Christmas!! Great post i enjoyed reading it :) My fav thing is of course the gorgeous colour of the changing leaves and the fact that christmas is round the corner yay!